Please bring pens, pencils, markers, paper, scissors, cuttings from newspapers and magazines, laptops or tablets to type on etc. The aim of the afternoon is to document our experiences of coming out in some way. This could be done through writing, drawing, painting, cutting & sticking…whatever floats your boat! Any format is fine; comic, blog, photos, rants, short stories, poems, interpretive dance… Any/all ideas welcome! 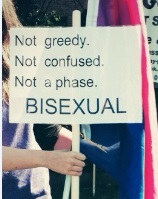 *Biphobia, how does it affect you and your decision to come out? *Do you tell people about your sexuality? Why, why not? *Make a guide to coming out. *Make a list of resources related to coming out. *Create something like biphobic bingo! *Your best/worst coming out stories. Why do all this? Well members of our community are affected by bi erasure. Our lives, stories and experiences will go undocumented unless we capture them. Let’s put stuff like this out into the public and show people we exist! Encourage LGBT people and organisations to include us. This is a great chance to raise awareness about coming out, the issues we face and help combat erasure. We can also create resources about coming out for others who are attracted to more than one gender. Things that people have written/made will be posted online and made into mini booklets and magazines to sell at zine fairs. We can dream bigger if we like…maybe this could form part of a display in libraries for LGBT history month next year!? Don’t worry if you’re not sure what to do. I will provide prompts and examples to start us off. Your creations can remain anonymous if you want. If you can’t make this date, or don’t live in the East Midlands, why not write/create something and email it to nottinghambitopia@gmail.com? Or perhaps you can give something to Hannah (group leader) in person at a later date? 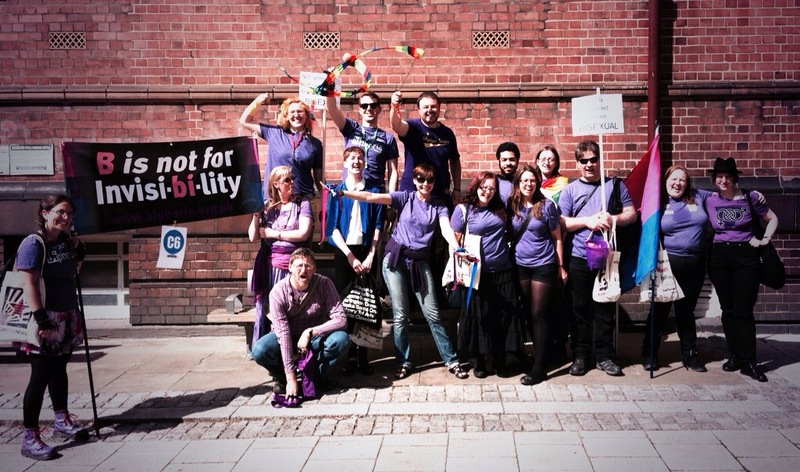 Last year I took part in Manchester Pride Parade for the first time by joining BiPhoria’s walking entry. It was an amazing, exhilarating experience but I left with a lot of ideas of things I wanted to try for the parade in 2014. The parade at Manchester Pride is massive. Thousands of people line the streets to watch behind metal crowd barriers. Over 100 entries take part and many of the larger groups and businesses have decorated floats, marching bands, goodies to hand out to the crowds and amazing costumes (e.g. people on stilts). Things which are sadly beyond the scope of smaller walking entries comprised of a 10-20 people like BiPhoria. Last year whilst we were walking in the parade I noticed a lot of puzzled looking people, and I could hear some in the crowd asking those stood next to them who we were. However I did notice that the bisexual flag was being photographed a lot, and people really responded to the bubble swords I’d brought; often asking for photos of us/the flag with bubbles in! To prevent the bisexuals from getting lost amongst all the larger, more well known entries. To help people realise who we are and why we’re there. So I made two A3 sized signs and taped them onto broom handles for people to carry and brought two sets of poi. This worked really well as I could see/hear people reading the signs. When someone asked who we were I heard the reply of “They’re the bisexuals!” One of our party was even filmed twirling poi by a camera crew from Channel 4 before the parade started, and a few of us managed to stand behind him holding our banner! (Though I haven’t been able to find footage of this anywhere yet.) Another member of the group brought little pots of bubbles which again went down very well. Lots of kids kept shouting us over so they could have a go at blowing some bubbles for themselves. So cute! The signs meant we could put out a more visible message against biphobia, and increase awareness that bisexuals exist and have their own group/scene in Manchester. I hope it made people think and helped challenge some of the assumptions made about us and our sexuality. I’d like to use the signs for BiTopia in the Nottinghamshire Pride Parade next year. The people who marched with BiPhoria this year.